(Nanowerk Spotlight) Researchers are very interested in investigating the biomechanical properties of the inner structure of cells due to their relevance in many important topics in biology such as intracellular and intercellular dynamics; tissue and organs formation and their homeostasis; but also in medicine as the formation and development of diseases like inflammatory disorders or tumor. In order to study inner cell properties, researchers often use internalized particles as micro- or nanoprobes. However, almost all available techniques provide only two-dimensional manipulation and tracking of these particles. "Besides the use of particle tracking methods, the decipherment of the complex dynamics at the single cell level also requires novel techniques that provide additional information about dynamical changes of the cell morphology," Cornelia Denz, a professor at the Institute of Applied Physics, University of Muenster, tells Nanowerk. "Especially for the quantitative study of dynamic cellular processes, quantitative phase microscopy is more suitable than other qualitative imaging techniques." Reporting their work in the November 23, 2012, online edition of Small ("Three-Dimensional Exploration and Mechano-Biophysical Analysis of the Inner Structure of Living Cells"), Denz and her group, together with researchers from the university's Center for Biomedical Optics and Photonics, have now presented a biophotonic holographic workstation that combines the complementary features of holographic optical tweezers (HOT) and self-interference digital holographic microscopy (DHM), in order to investigate biomechanics properties at the single cell level. "On the one hand, HOT enable to confine a microscopic object of nano- or micrometer size and move it precisely in three-dimensions by means of tailored light fields," Álvaro Barroso, a PhD student in Denz's group and first author of the paper, explains. "On the other hand, DHM in off-axis configuration provides amplitude and quantitative phase information of the optical wave that propagates through a transparent sample. This allows simultaneous quantitative phase imaging of the cell morphology as well as 3D tracking of transparent objects without fluorescence labeling." In their study, the researchers show that the combined implementation of HOT, DHM, and microspheres (1µm) as sensitive probes inside cells provides a novel mechanobiological tool for minimally-invasive quantitative 3D probing of the intracellular morphology without any fluorescence labels. 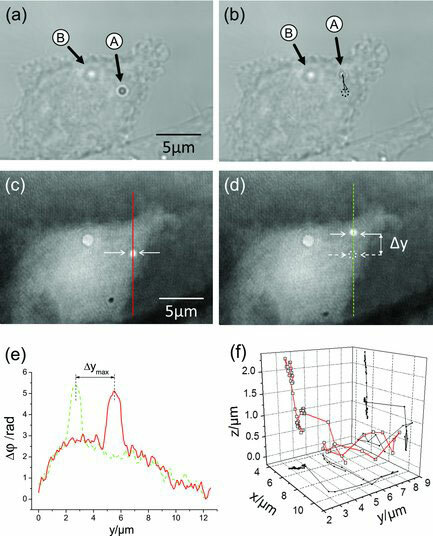 The polystyrene particles, incorporated into cells by phagocytosis, can be moved at will with submicrometer accuracy within the cellular volume. Barroso notes that the movement of the probe particles – which is restricted only by intracellular constraints – together with an accurate estimation of the exerted forces, provides key information about the inner cellular structure. "In addition, our approach demonstrates to be minimally invasive as neither the trapping laser beam nor the imaging laser source induces serious damage to the investigated cells" he says. In their proof-of-principle study, the scientists demonstrate the capability of their method by analyzing the inner cell structure changes during a very important biological process: cell swelling provoked by osmosis stimulation. This paves the way to study the intracellular changes during other dynamic cellular processes. Furthermore, this novel approach allows to determine the damage in living cells induced by the trapping laser. This can provide valuable information to be used in related studies where the effect of the trapping laser on the biological specimen is unknown. Going forward, the team plans to extend their study to living organisms. In this respect, model organisms such as zebra fish (Danio rerio) are good candidates to explore in vivo the intracellular structure by sensing the movement of optically manipulated internalized particles.